In this video, a 1.0 kg roll of paper towels is dropped from a height of 0.5 meters onto a bathroom scale. 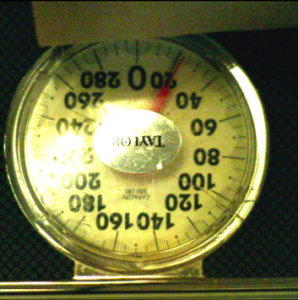 The needle on the scale shows the reading in pounds (force) every 0.001 seconds as the paper towel roll slows to a stop. When doing calculations, please note that the collision was not perfectly inelastic. The paper towel roll did bounce back up slightly upon impact. Assuming the paper towel roll hits the scale at a speed of 3.1 meters/second, what is its initial momentum before the collision? Assuming the paper towel roll comes to rest, what is its final momentum after the collision? What is the magnitude of the change in momentum for the paper towel roll? Create a data table of force for every 0.001 seconds of video time. Be sure to convert the force to Newtons! Compute the impulse on the paper towel roll from the scale every 0.001 seconds. What is the total impulse on the paper towel roll from the scale? Does the total impulse on the paper towel roll match the change in momentum of the paper towel roll? Why or why not?